Prior to the investment half of all children in the village died from water borne diseases because their water source had been the nearby pond. Frank had noted the pond when he walked past - it was so covered in green algae Frank had thought he could walk across it without sinking, possibly without getting wet. The well was just a source of water to Frank. To the village elder it was a source of hope for the future of the village because of the great change it had made in their lives. Frank visited a hospital caring for young polio patients on another trip. A young girl was lying in her hospital bed with a cast from her waist to her toes. She was a polio survivor who had just gone through surgery to correct the deformity polio had made to her leg. She would walk with a limp the rest of her life, but she had survived. Frank asked how she had gotten polio when hey had vaccinated all the kids the previous year. The doctor explained that despite all the incredibly detailed record keeping she had missed getting her drops of vaccine, as had all the patients her age. Then Frank noted that no one in the ward was in an iron lung. He asked about that thinking they were in another area of the hospital. The doctor explained that " No, there were no patients in the hospital where polio had effected the lungs. They couldn't use iron lungs because the electricity supply was too unreliable. Those children stayed at home and slowly asphyxiated." When Rotary originally proposed eradicating polio they asked the World Health Organization and UN for assistance. Both organizations said it could not be done. The countries that needed the assistance the most could never treat all their children on a tight enough schedule. In response Rotary worked with India to organize the first polio vaccination day. On that first attempt, 120 million children were vaccinated in one day. The impossible had been done and the effort was officially launched throughout the world. On another trip to India, Frank visited a leper colony where 4 wells and 2 toilet systems had been installed through Rotary projects. One of the women thanked Frank for giving her and all the girls their privacy. Before the installation of the toilets they had only the fields to use. For the girls it also meant they could stay in school past puberty, since they could now take care of their personal needs in privacy. Perhaps more importantly, child marriage was ending. The girls could now still function within their families with that privacy. 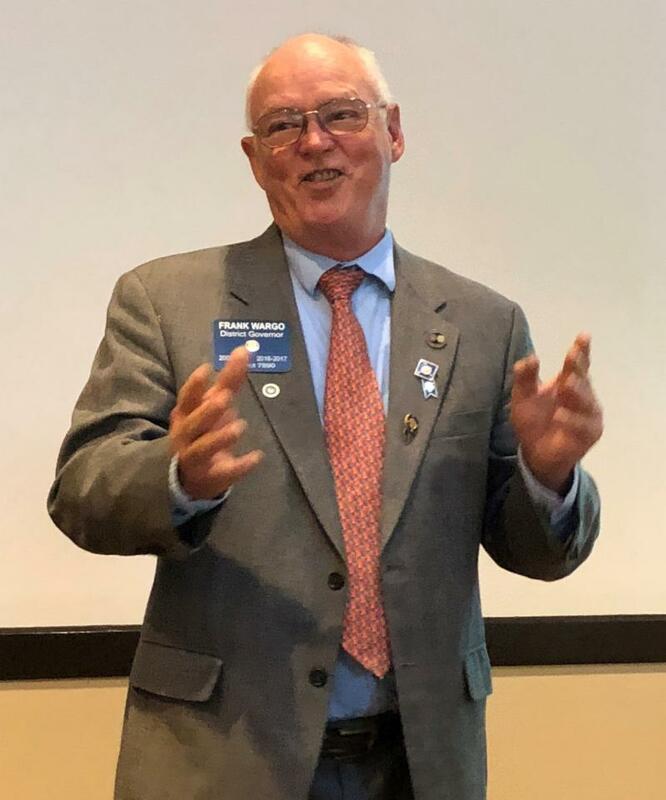 Frank assisted one project with a book he wrote about his experiences traveling the world for Rotary: The Frank Wargo Story, A Rotarian's Ventures and Adventures. He sold enough copies to raise $40,000, which paid for 2,000 people to have cataract surgery. The impacts were far greater than just restoring site. A grandfather who had been assisted by his granddaughter all day before the operation was now independent again. His dignity and usefulness were restored. More importantly the granddaughter was now able to attend school.